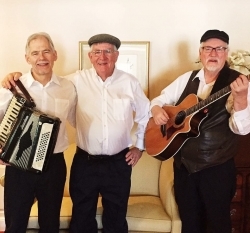 Boston Rovers consists of Paul Harty, Jim Murray and Taylor Whiteside, all who have been performing for many years. This concert, along with all other concerts in the series, is free to the public. Our sponsor for the evening, McCue Garden Center, will be serving free fresh steamed corn for all concert goers. For your comfort and enjoyment, please remember to bring folding chairs, blankets and insect repellant. If the concert is postponed due to weather conditions, the rain date is Friday, August 10. Visit SCIWoburn.org for updates on this concert and for the full concert schedule. A big thanks to our sponsor for the evening! McCue Garden Center has been the Hometown Garden Center of Woburn since 1933. Fresh sweet corn and tomatoes picked daily through the summer. A fresh vibrant selection of annuals perennials, shrubs, and knowledgeable friendly customer service.